Old tech is cheap, so there are a few manufacturers of helmets who decided to take what works and sell, sell, sell. Like everything today, your cutting-edge helmet is going to be old news in a few weeks, so saving your pennies might be smart. Cyber helmets are not at the cutting edge of engineering, but they will keep your noggin in working order. Cyber's US-216 modular boasts a DOT-approved polycarbonate shell. Channeled EPS improves the venting capabilities from the adjustable chin and top vents, and the liner is removable and washable if you're a prodigious sweater. Smokers and the poor-sighted swear by the convenience of modulars. A single release tab for the chin bar makes grabbing a quick drink or bite at a roadside park fast and easy for those of us who want to make good time. 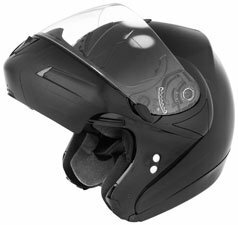 Theoretically, the visor has a quick release feature to make removal or exchange easy. The mechanism, however, is mostly plastic. If you're gentle with it, the fast-action claims should hold true, but be a little careless and you could break it. Price is of specific interest in today's economy, and this is where the Cyber US-216 shines. It is not the cheapest you can buy, but I would never get the cheapest anyway. The US-216 can be had for under $150. If this makes you nervous, turn away now; otherwise, this could be how you afford the comfort and engineering of last year's $300 modular.